Michael Cole, Jerry Lawler, and Matt Striker are on commentary. Sheamus has been the Champion since 12.13.09, and this is his third defense. Cena qualified by beating Cody Rhodes, HHH beat Jack Swagger, Orton beat Shawn Michaels, DiBiase beat Mark Henry, and Kingston beat the Big Show. This is Sheamus’ first time in the Chamber, Cena’s third time (with one win), Kingston’s first time (though he was scheduled to be in one last year until Edge took him out), Orton’s third time, HHH’s sixth time (with four wins), and DiBiase’s first time. Sheamus and Kingston are the unlucky two starting the match. They take it to each other while the crowd chants “RKO.” The champion uses his size and power to neutralize Kingston’s speed and agility. Kingston gets a little bit of offense in but Sheamus mostly controls the first portion of the match. The Game is the third man in the match and the crowd is amped. HHH trash talks the champion and they start slugging at each other. It’s all HHH as Kingston takes some time to recover. Kingston picks his spot and roars back into the match, quickening the pace. He sends HHH over the ropes to the chamber floor and follows him out with a Boom Drop. Sheamus takes control as Orton is released from his pod. Orton goes right after the WWE Champion but is an equal opportunity mauler here. After Orton’s initial onslaught the other three recover and nobody seems to be in a dominant position. DiBiase is the next man in the match and he focuses on HHH. He stares down his Legacy leader Orton and offers his hand to help him up. They decide to work together, which is good strategy. Orton and DiBiase go to work on everyone, even shoving Kingston’s head through the chamber wall. DiBiase traps Kingston in a Boston Crab while Orton stomps on him. At DiBiase’s behest, Orton hits HHH with the DDT to the Chamber floor, which sounded sick. Next up is Cena, and Legacy is waiting for him as he exits. Cena is all fired up though and thwarts their attack. He hits DiBiase with an Attitude Adjustment over the top rope and onto the steel. Cody Rhodes comes running out to give DiBiase a lead pipe, and he strikes both Orton and Cena with it! DiBiase decides to cover Orton and scores the first elimination at 24:01! Unfortunately for DiBiase, he’s the next to go when Kingston hits him with Trouble in Paradise for the elimination at 25:30. Sheamus then drops Kingston with the Brogue Kick and then hits the Pale Justice to eliminate Kingston at 26:12. We’re down to three. Sheamus hits Cena with the Irish Curse and a powerslam for two. He goes for Pale Justice but HHH breaks it up and then hits Sheamus with the Pedigree and the WWE Champion is gone at 28:36. We’re guaranteed a new WWE Champion now. Cena immediately locks on the STF and HHH tries to fight it off but is forced to tap out at 30:21! That was the usual great effort in the Chamber, and I liked the structure of the eliminations, especially the way DiBiase eliminated Orton. Sheamus also looked good in defeat. This is Cena’s sixth WWE Championship and eighth overall. Vince McMahon comes out and announces that Cena is now forced to defend his newly won WWE Championship against Batista. I don’t remember why Batista got this title shot, but here it is. Cena sells the Chamber like death, but he was only in the match about 10 minutes, and Cole claiming that he just survived 45 minutes in the Chamber is just ludicrous. I hate it when they exaggerate claims that don’t need to be exaggerated to be impressive. Cena has been the Champion for a couple of minutes, and this is his first defense. He looks ready for a fight, as Striker keeps up the claim that the previous match was almost 50 minutes. Batista cuts Cena in half with a Spear and then hits the Batista Bomb to get the win and capture his second WWE Championship at just 0:33. I’m generally not a fan of title reigns lasting less than two minutes. McIntyre has been the Champion since 12.13.09, and this is his third defense. Kane goes on offense right away and grounds McIntyre with a headlock. He hits a swinging neckbreaker for two. McIntyre comes back and starts going to work on Kane’s arm, which is wise for avoiding the Chokeslam. Kane powers up and simply forces McIntyre over the top rope to the floor. Back in the ring McIntyre goes right back to the arm. He tries the Future Shock DDT, but Kane blocks it and hits a big boot. McIntyre battles back and goes to the second rope but he jumps right into an uppercut punch for two. Kane goes up top and hits the big clothesline. He signals for the Chokeslam, but McIntyre slips out to the apron. Kane follows the champ out and runs him into the turnbuckle and then boots him to the floor. He slams McIntyre’s face into the steel steps and then throws him back into the ring. McIntyre tries to beg off but Kane stomps away at him, so the champion bails. They fight in the aisle and Kane brings McIntyre back to the ring again. Kane goes for a Chokeslam but McIntyre pokes him in the eyes and hits the Future Shock DDT to get the pin and retain the title at 10:11. That seemed a lot longer than it was. Maryse beat Brie Bella and Eve to get here, while Gail defeated Jillian and Alicia Fox. The title has been vacant since January 4, 2010, when former champion Melina was too injured to continue defending her title. Before the match can begin, Vickie Guerrero comes out and says she doesn’t appreciate the Raw divas talking trash about the Smackdown divas. So, she postpones this match and changes it to a tag team match featuring Maryse and Gail Kim against Michelle McCool and Layla of Smackdown. Gail and Layla start the match. After some basic back and forth Michelle interferes from the apron, kicking Gail off the apron and down to the floor. Michelle tags in legally and they hit a double baseball slide on Gail before bringing her back in the ring for a two-count. After a further beating from Michelle, Gail fires up and hits a big clothesline. She goes for the tag but Maryse pie-faces her (shouldn’t that count as a tag?) and Gail turns around right into a big boot. Michelle follows up with the Faith Breaker to get the win for Smackdown at 3:38. That really has no place on PPV. After the bell Maryse hits her own partner (and opponent tomorrow night on Raw to decide the Divas Title) with the French Kiss DDT. The 2008 King of the Ring, William Regal, comes out to announce the debut of WWE NXT this coming Tuesday. Regal, along with seven other superstars, will be “Pros” to eight rookies on the show. The crowd starts to annoy him by chanting “What” and the 2010 Royal Rumble winner Edge comes out to interrupt. Edge announces that he will decide who he faces at WrestleMania tomorrow night on Raw. He then hits Regal with a Spear. Miz has been the Champion since 10.5.09, and this is his sixth defense. He’s accompanied by his Unified Tag Team Championship partner the Big Show. MVP is joined by his tag team partner Mark Henry. The challenger is fired up and he takes it right to the champion from the bell. Miz spills to the floor and MVP follows him out to continue the assault. Back in the ring Miz gets a couple of maneuvers in but MVP quickly cuts him off and goes back to work. MVP tries to float over in the corner but Miz catches him and hits an inverted Codebreaker for two. I don’t think I’ve seen anyone else do that move. Miz uses a chinlock and MVP powers up with an electric chair drop. The champ perseveres though and hits the short DDT for a two-count. Miz goes up top and MVP joins him up there and takes him down with a belly-to-belly suplex for two. MVP is fired up now, unleashing a flurry of offense on the Miz. He hits the Ballin’ Elbow and Miz gets his foot on the bottom rope. Show pulls Miz to the floor to give him a break, and Henry doesn’t take too kindly to that. Henry charges at Show, who evades him and Henry crashes through the barricade. Back in the ring MVP misses the Drive-By and Miz distracts the referee, allowing Show to sneak in a knockout punch and Miz gets the pin at 13:02. Miz had yet to hit his stride as worker and MVP was never all that great so this just seemed to go on forever. Undertaker has been the Champion since 10.4.09, and this is his seventh defense. He’s been in this match twice (with one win), Jericho is making his sixth appearance, Mysterio his second, Punk his second, and Morrison and Truth are both making their debuts. Morrison qualified by beating Kane and Drew McIntyre in a three-way match, Truth beat Mike Knox, Punk beat Batista by countout, Jericho beat Matt Hardy, and Mysterio beat Dolph Ziggler. There are 77 Championships, including 16 World Titles, between the competitors in this match. Punk comes to the ring flanked by Luke Gallows and Serena and cuts a straight edge promo before starting the match with R-Truth. Truth starts off on fire, taking it to the Straight Edge Superstar and sending him to the chamber floor. He catapults Punk into the chamber wall, and then throws him into Mysterio’s pod. Truth then scales the top rope and wipes Punk out with a somersault. Back in the ring Truth continues the beat down, hitting Punk with the Stroke. Punk avoids the Axe Kick and tries the Go 2 Sleep, but Truth avoids it. Truth goes for the Lie Detector but Punk ducks. Punk drills Truth with a kick to the head and then hits Go 2 Sleep to eliminate Truth at 3:35. Instead of just relaxing, Punk grabs the microphone and talks trash to the Undertaker. Mysterio is the next man out of the pod and he is all over Punk, flying around the ring. Punk fights back as they keep up a fast pace. Mysterio climbs to the top of one of the pods and Punk joins him up on the top rope. The masked superstar knocks Punk down and hits him with a hurricanrana onto the chamber floor. Punk rolls into the ring and Mysterio follows him with a springboard splash to eliminate Punk at 9:58! Mysterio gets very little rest before Jericho becomes the fourth man in the match. These two had a hell of a feud over the Intercontinental Title in 2009, and they pick up right where they left off. Mysterio puts on the End Time, which Striker calls the Dragon Sleeper. Jericho fights it off and puts on the Walls of Jericho as Morrison makes his way into the match. Morrison is a house afire, taking on both Jericho and Mysterio. He goes up top and Mysterio knocks him back into the pod. Jericho then backdrops Mysterio to the chamber floor, as Striker notes that “It’s almost like everyone in the arena knows who’s coming next.” Obviously, they do you twit, there’s only one guy left! Morrison makes his way back into the match and almost pins Mysterio with a standing shooting star press. Mysterio responds with a rana and tries the 619, but Jericho cuts him off with the spinning backbreaker. Offense continues coming from all over the place. Mysterio hits Morrison with a rana and sets up top for a super rana, but Morrison blocks it and hits Starship Pain to eliminate Mysterio at 20:02! Jericho traps Morrison in the Walls of Jericho until Undertaker’s pod opens, and Jericho breaks the hold. The champ is all over Jericho, throwing those big soup bone right hands, Snake Eyes, and a big boot to the face. He dumps Morrison out and leg-drops Jericho for a two-count. Undertaker goes for a double-chokeslam, but Jericho and Morrison block it and hit a double suplex. That’s a wise move for them to work together. It doesn’t last though, as Jericho backdrops Morrison out of the ring. Jericho then foolishly fires up the Undertaker with slaps and pays for it. Undertaker goes after Morrison too, but Morrison drills him with the Beautiful Disaster kick. Morrison goes for Starship Pain, but Undertaker gets his knees up. Undertaker pitches Morrison to the chamber floor and tries for a powerbomb but Jericho breaks it up and Morrison hangs on to the wall. Jericho throws Undertaker into a pod and Morrison flies off the wall to wipe Jericho out. Back in the ring Morrison hits a Shining Wizard but Jericho kicks out. Morrison goes for a springboard move but Undertaker catches him and Chokeslams him into the Chamber floor. Undertaker pulls Morrison into the ring and eliminates him at 28:24. The straps come down and Undertaker looks like he’s about to get medieval on Jericho. They fight up to the top rope and Jericho takes the champion down with a superplex. Jericho gloats as he’s in control of the champion. Of course, that proves to be a bad idea, as Undertaker grabs him by the throat. Jericho rolls through that though and locks on the Walls of Jericho. Undertaker reverses that to a Hell’s Gate attempt but Jericho slides through the ropes to avoid it. Jericho then hits Undertaker with the Codebreaker, but it only gets two! Foolishly, Jericho goes for mounted punches in the corner and just guess how that ends. Undertaker signals for the end but Shawn Michaels pops up from underneath the Chamber and drills Undertaker with Sweet Chin Music! Jericho crawls over to make the cover and get the pin to become the new Champion at 35:36! 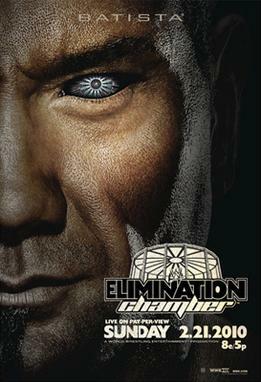 More awesome stuff in the Chamber with great performances from everyone involved, and the ending sequence with Undertaker and Jericho was particularly awesome. The two Elimination Chamber matches are four stars or higher, and they take up more than half the show so that’s an easy recommendation right there. Besides the Chambers though, the rest of the card is absolute garbage.